Free Alarm Clock for Windows XP - classic alarm clock with a simple interface. Using the functions of the application, users can set the automatic activation of the sound signal for a specified time. The program is equipped with a calendar, thanks to which it is possible to set the signal to turn on for a given day. There are several standard melodies to choose from users, but if this is not enough, the utility allows you to put your own songs on the call. The wake-up tool is able to automatically turn off the "Sleep" mode on the computer during the alarm. 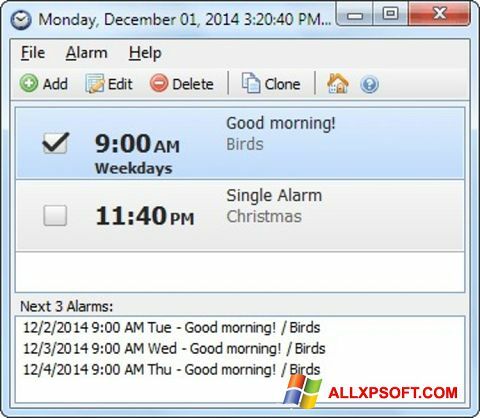 You can free download Free Alarm Clock official latest version for Windows XP in English.